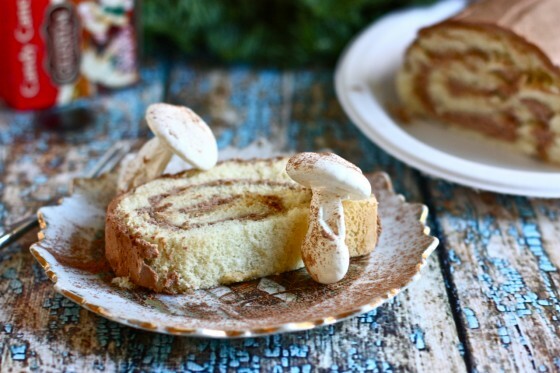 Everything about this holiday dessert is just so pretty—from the perfect cake roll slathered with mocha buttercream frosting to the adorable meringue mushrooms. I love it all and thank great grandma for this perfectly timeless recipe. Reader beware, if I was on a retro dessert kick before my trip to the Midwest, I’m really on one now. That’s what hanging out with Grandma will do, I’ll tell you. 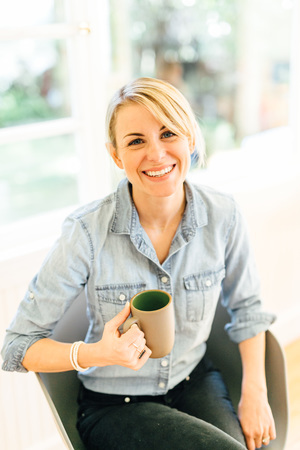 I’m just so thankful I got to spend some time with her recently and talk recipes, a favorite topic for both of us. 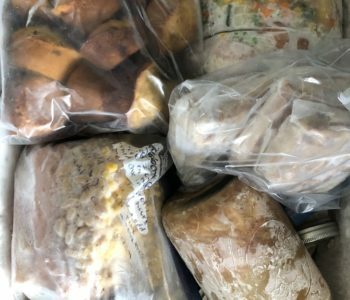 She told me that every Sunday was deemed “baking day” in her house growing up, and on that day her mother (my great grandmother whom these recipes are from!) would tie on her apron and bake two dozen soft white rolls drizzled with powdered sugar icing as well as a chocolate layer cake for the week. And this was during the Great Depression! Can you even imagine? She had three small children to feed and who even knows how many neighborhood kids. I like to think she also made this special dessert on Sundays as well during December. 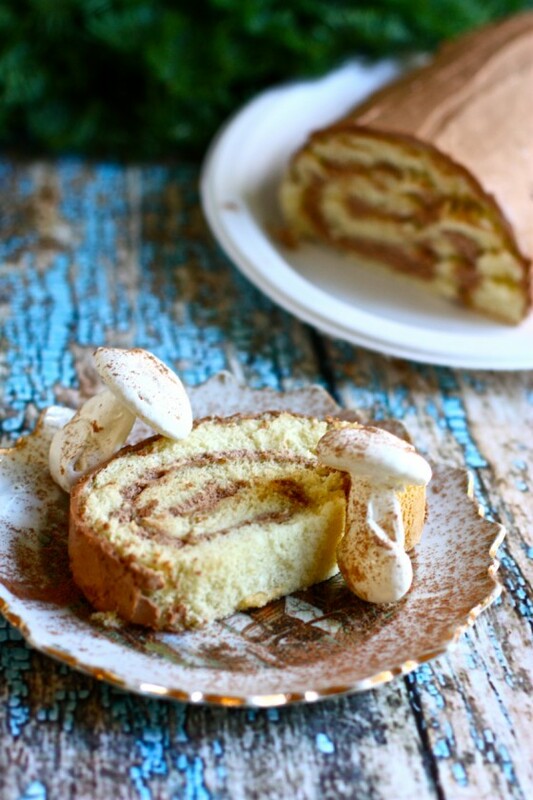 If you’ve ever been intrigued by a bouche de noel (or yuel log), this is your day! Trust me, it’s not as difficult as it seems but it is time consuming. 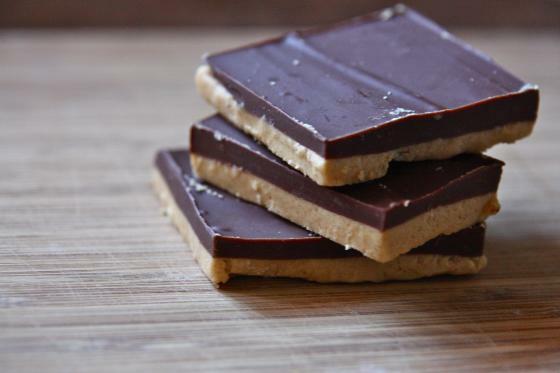 Plan to make this dessert on the weekend where you can afford to spend all day in the kitchen. 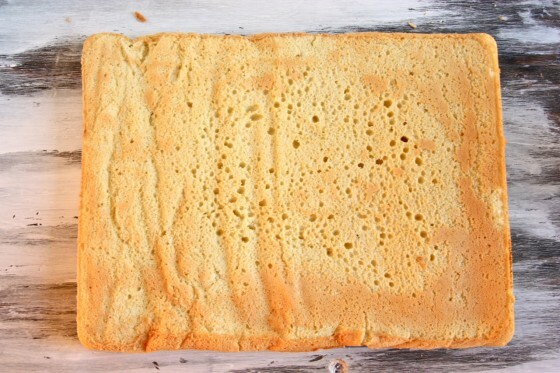 The first step is to make the sponge cake. These types of cakes are made without any baking powder or baking soda and rely purely on beating the heck out of the eggs for a rise. This time around, I used a tip I read about on Smitten Kitchen to wrap my cake roll in a clean dishcloth to avoid any cracks. It totally worked! Just run a knife along the edges of the jelly roll pan to release the cake (gently!) then place on a large clean dishcloth and roll up the cake in the cloth. Let the cake cool like this then unroll—it’s like magic! Great Grandma called for a chocolate whipped cream frosting for the inside of the cake roll and a DELICIOUS mocha buttercream for the outside. And when I say “delicious” I mean this mocha buttercream was one of the best frostings I’ve ever tasted and it took every ounce of self control not to stick my face in the mixing bowl. Grams wasn’t joking when she made the note at the bottom of the recipe that “this frosting is also delicious on other cakes as well”. For reals. Is frosting a food group? The meringue mushrooms were not part of the original recipe but rather my own addition. Different bouche de noel recipes vary, but meringue mushrooms are usually a pretty standard decoration. Yes, I’ll have both my cake and cookies, please. To sum it all up, this dessert is time consuming but so worth it!!! I love the finished presentation all dusted with cocoa powder or powdered sugar. You’re going to love it! Beat the egg yolks until very pale and thick. Set aside. In another bowl, whip the egg whites until stiff peaks form. Gradually add sugar, salt and vanilla extract. Fold egg yolks into egg whites and then gently fold in flour. Spread mixture onto a WELL GREASED and LINED (either with a Silpat or parchment paper) jelly roll pan, smoothing it out with a spoon or off-set spatula. Bake for 10-13 minutes, until just slightly starting to turn golden. Once cake comes out of oven, run a knife along the sides of the jelly roll pan and turn cake out onto a clean dish towel. Do this slowly! 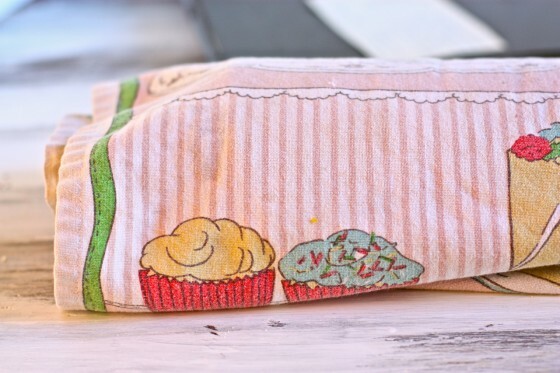 Then, wrap up dishtowel and cake together. Let cake cool for 20 minutes wrapped up like this then unwrap cake and lay flat. While the cake is cooling, whip the cream for the filling and add the cocoa, powdered sugar and salt. Spread whipped cream onto cooled cake, leaving an inch border around all sides. Roll cake up with filling. Then, make the mocha buttercream. Beat the butter and buttered sugar until very light and fluffy. Add cocoa. Mix together the instant coffee and boiling water and add to frosting. Continue beating on high speed for another ten minutes until VERY VERY FLUFFY AND LIGHT (you can’t over-beat this…keep going). 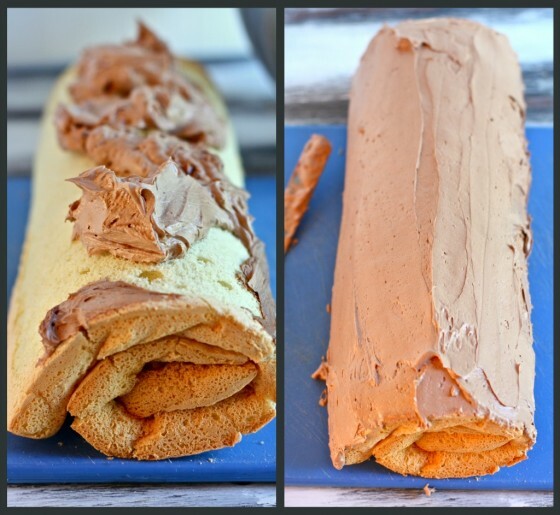 Spread frosting all over the top and sides of the cake roll. Place in refrigerator while you make the mushrooms. To make the mushrooms (these are optional but super cute and fun), whip the egg whites with the sugar and cream of tartar until stiff, glossy peaks form. 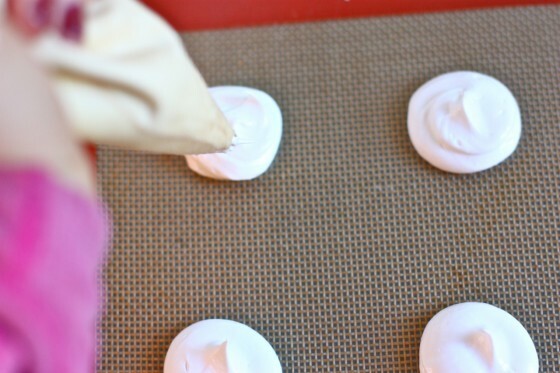 Pipe out of a pastry bag or plastic bag into 10 little mounds on a lined baking sheet. Then, pipe 10 little “stems” to go with the mounds (just a thick short line of meringue). Save one tablespoon of meringue and place in fridge. Bake mushroom caps and stems at 200 degrees for 1.5 hours, until very light and perfectly crisp. Remove from oven and “glue” mushroom caps and stems together with your leftover meringue. Carefully place mushrooms back on the baking sheet and resume baking for another 30-45 minutes until “glue” has baked. Let mushrooms cool before using. To assemble and serve the buche de noel, cut a slice of the cake roll and place on a plate that you already sifted with cocoa powder. Sift cocoa powder on two meringue mushrooms and place mushrooms next to or on top of cake roll. Serve. This cake looks beautiful! I honestly don’t think I could tackle the rolling of the cake but I wouldn’t mind eating it!! I didn’t realize these recipes are from your grandmother that is still alive! For some reason, I thought she had passed away years ago from previous entries. Does she read along? she’s not—I visited my grandmother, who’s mother–my great grandmother—(who passed away in the 1980’s) is the one who wrote all these recipes. You had me at the first mention of mocha buttercream icing. Yummm! 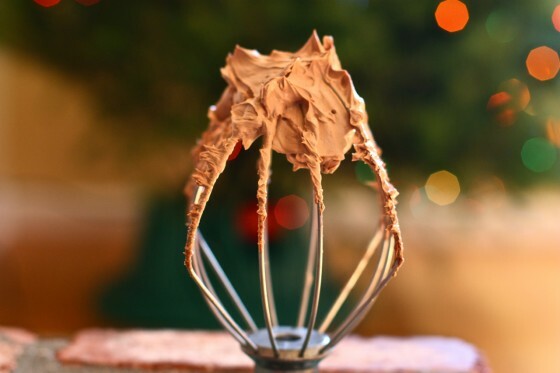 I’ve never even heard of this, but mocha buttercream sounds fantastic. Meringue mushrooms! I love the retro kick! Your grandmother is now on my list of people who I would love to meet- wow! Looks wonderful! I have a feeling it would take me a few tries to make it look good! Great job on the mushrooms! I thought they were real…and was also wondering about that pairing. Everything about this sounds delicious! So pretty! That frosting sounds so good. I made a “stump de noel” a couple years ago and made meringue mushrooms and sugared rosemary and cranberries to decorate it. Such a perfect holiday dessert. I love that you’re on a retro dessert kick And I can’t even pronounce buche de noel but I want it. Now! I love the notecard, in the grandma penmanship (mine and yours must have had the same cursive writing teachers as they look similar!) and the surface that’s retro painted underneath it (very cool!) and the rolled recipe….everything about this post, I love. That cake is beautiful! Love the little mushrooms. I would have to gear up to do one of these rolling cakes, but the results look worth it. 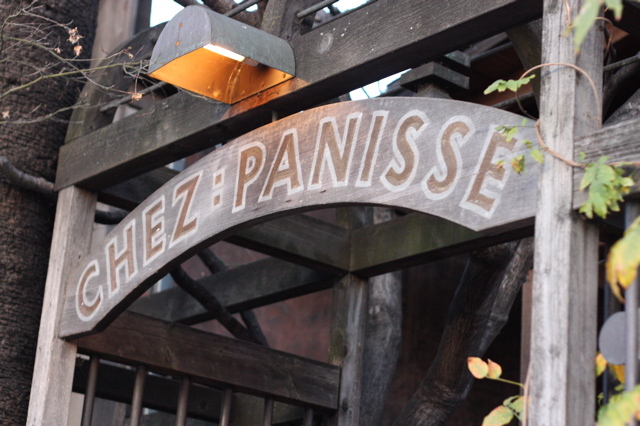 A buche de noel totally spells Christmas for me.. Love your dish towel – where’d you get it? the pictures in this post are beautiful! haha love the little mushroom meringues! Very cute and I’ve never seen something like those. 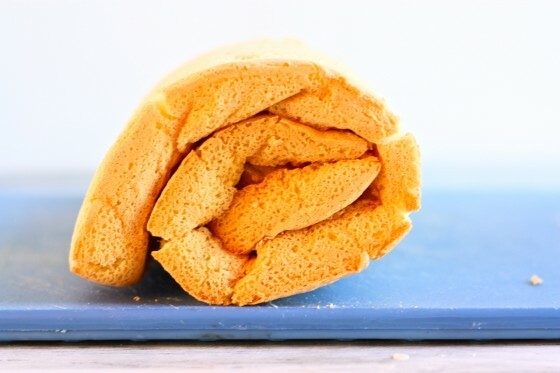 The great thing about these roll desserts is that they don’t have to look perfect at all! 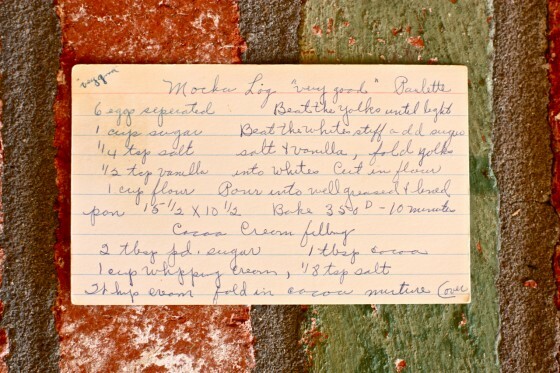 Your grandmother’s recipe card looks JUST like the ones that I have from my grandma and great aunt – down to the “very good” written next to the recipe’s name! It must have been a Midwest thing? The only thing that’s different is my grandma’s recipes often came completely without measurements – just “salt” and “vanilla,” no way of telling how much to add! I love bûche de noël! My family and I make one every Christmas, though this year I’m determined to add the meringue mushrooms to the mix–usually I just pipe the decorations. That’s so funny-your grandma’s handwriting is very, very similar to my own and they both put remarks in quotes. Aww, beautiful and just in time for Christmas baking! I think I’ve made one of these exactly once, with a friend for our French class in middle school. According to this post, the great depression doesn’t sound as bad as I thought! Chocolate cake every week?! YUMO! Frosting is most definitely a food group! I’ve always wanted to attempt this but feel so intimidated. (I know I say that to a lot of things you make! Haha. It’s just true). Looks incredible! I have always wanted to make this. My Hungarian aunt can whip this up like it’s nothing and still cook an entire dinner in her tiny little kitchen. I love hearing the little back stories to the recipes. 😀 Hope you had a great time out in the Midwest. Your trip reminds me that I should visit mi abuela soon. this is a beautiful cake! you did an awesome job on your first buche de noel! it’s on my to-do list 🙂 the mocha buttercream really does sound amazing!! I wonder if there’s a recipe in that box for mayonnaise chocolate cake … my grandmother said it was quite a popular dessert during the Depression, as it used no eggs. There are recipes for it all over the internet. 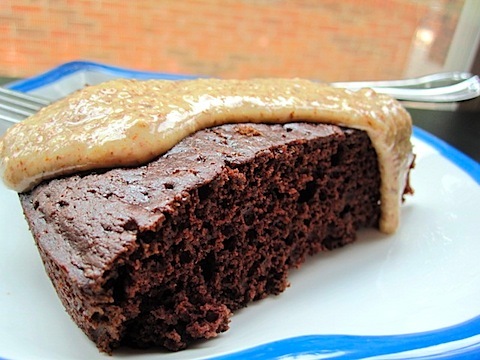 It’s moist and chocolatey and delicious! I LOVE how you recipes are from your Great Grandmother! I always love a good roulade and this looks incredible… Mmmmmm :). And the mushrooms are to.die.for. I love this and all your old recipes! Are you displaying any of your old recipes? There are so many fantastic ideas on Pinterest! Oh man. I made one of these in 7th grade for my French class and it did not withstand the rolling very well. My mom convinced me just to cut the layers and stack them, and then I put a ton of icing on it to make it more log-like. I was so embarrassed when I had to bring it to class. I suppose meringue mushrooms belong in the vegetable group. Wow, that is a beautiful cake! I love stories about the good ole days, it amazes me what the women before us accomplished with large families and very little money! Love seeing that old recipe card! Thats how you know its good! I love your grandmother’s handwriting – weird comment, yes- because it’s exactly like my great grandmother, Nana’s. I kind of feel like women from a certain generation learned handwriting the same way. My boyfriend’s parents are coming out from Wisconsin (where we’re all from – I drink Alterra coffee everyday, and worked for the people who run Iron Horse! ) for Christmas. It’s our first “grownup Christmas,” and I’ve had a buche de noel on my mind every since I had one when I studied abroad in Paris. Thanks for the fabulous recipe. I feel like we could be friends! Oh my, these mushrooms are too cute!! I want to make some… but that means I would have to make a log…. that scares me some. I will for sure be making the frosting soon though, delicous! I love the mushrooms…they’re so delicate and pretty! my great aunt’s recipes are so similar, with”good”, “very good” etc. written on the side of each handwritten note as well! I’ve always wanted to try one of these after I saw Martha Steward make one of these eons ago. Those little meringue mushrooms are so stinkin’ cute. Beautiful! I was wondering what those little mushrooms were, how cool! Here in Quebec the ‘Bûche de Noël’ is a traditional holiday dessert. Every year my grandmother makes it for Christmas. Her recipe is actually very similar to yours, but lately she’s been doing a raspberry ‘confiture’ filling instead of chocolate. I have wanted to try this for so many years and never have. I have been looking at so many recipes, and yours has won out, for flavor and ease ( have to say, bought the meringues on line from amazon.com, french connection, they are great! ) love the mocha frosting. Hope I can do this!! I am an experienced baker, but still nervous! My mother in law made the most wonderful Buche de Noel. She passed away in 2006 and we still miss her and this dessert at Christmas. Your recipe looks closest – the mocha buttercream was the key. I’m going to give it a try. Thanks for sharing this! I made this last night and it came out awesome. It will look great tomorrow as the dessert centerpiece. The frosting is soooo good. I’m going to make it to put on cupcakes next.